Welding gases fill an important role in welding operations; primarily, by preventing atmospheric gases like oxygen, nitrogen, and hydrogen from reaching the weld pool. Any one of these atmospheric gases has the potential to create problems with the finished weld quality if they were to reach the pool. So, shielding gas is a must. The question is which shielding gas should you use? 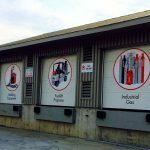 Many gases work in a variety of applications so there isn’t one go-to gas that you can count on to perform in any welding operation, which is why you’ll find so many different kinds of welding gases at Brampton suppliers. The most common shielding gases are Argon, Helium, Carbon Dioxide and Oxygen and choosing the right gas comes down to 5 factors, which vary from job to job. The Cost Of The Gas. Cost is a consideration in any manufacturing operation and some gases are more expensive than others. Carbon Dioxide (CO2) is the least expensive of the 4 gases mentioned above and it can be used in its pure form, which eliminates the need for a secondary gas, saving you even more money. Finished Weld Properties. Some pieces need to be finely finished, others can be cleaned up afterwards, and still others don’t have any special finishing needs. If you want flatter bed profiles, less spatter, or better wetting action, Argon or an Argon/CO2 mixture is the best choice. Argon is inert so it does not react with the molten weld, but it’s expensive. Adding CO2 can cut costs and still deliver acceptable weld quality. Preparation And Post-Weld Clean Up. Argon mixed with CO2 is a good choice if you are concerned with preparation and post-weld clean up. It provides good arc stability, puddle control, and reduced spatter when compared with pure CO2. The Base Material. CO2 and Helium provide very deep and wide welds making them great for thick base materials. Non-ferrous metals like aluminum, magnesium, and titanium, work best with pure Argon. Helium is also a good choice for these metals and for stainless steel. Oxygen works well with mild carbon, low alloy and stainless steel but it causes oxidation so avoid using it on aluminum, magnesium, copper or other exotic metals. Your Productivity Needs. The Argon/CO2 mixture works well in the spray transfer process, which can boost productivity. An Argon/Helium mixture is another favorite where speed is an issue. It produces a hotter arc, which travels faster and boosts productivity rates. Choosing the right shielding gas is a science of its own and your choice will be affected by the material, its’ thickness, the welding position, electrode diameter, and surface condition, to name just a few. To ensure you are getting the right gas for your application, download MSDS information from our website or, better yet, speak with a Josef Gas representative who specializes in welding gases in Brampton. 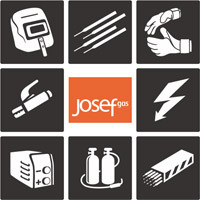 Call our team at 416.658.1212 or email us at info@josefgases.com for service and advice.